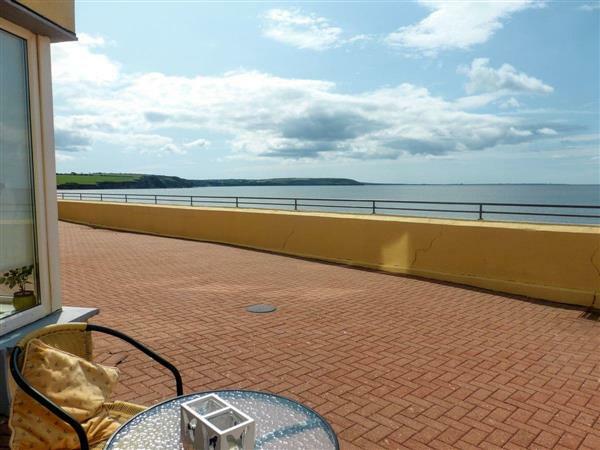 Apartment 1 in Duncannon, Co Wexford sleeps 2 people. This holiday apartment has a stunning sea front location overlooking a beautiful Blue Flag beach and both the living room and shared sun terrace have magnificent sea views. 13 steps lead from the road down to the property which is attractively furnished. This scenic area boasts many interesting attractions including the Hook Lighthouse, Tintern Abbey, the Dunbrody Famine Ship, the JFK Arboretum and Kilmakee Gardens. A visit to Waterford via the Ballyhack ferry is highly recommended. Shop, pub and restaurant 150 yards. Ground floor apartment for 2. This holiday apartment has a stunning sea front location overlooking a beautiful Blue Flag beach and both the living room and shared sun terrace have magnificent sea views. 13 steps lead from the road down to the property which is attractively furnished. This scenic area boasts many interesting attractions including the Hool Lighthouse, Tintern Abbey, the Dunbrody Famine Ship, the JFK Arboretum and Kilmakee Gardens. A visit to Waterford via the Ballyhack ferry is highly recommended. Shop, pub and restaurant 150 yards. All on ground floor: Living/dining room/kitchen with wooden floor and patio doors. Double bedroom with wooden floor. Shower room with toilet. Gas central heating, electric, bed linen and towels included. CD. Electric cooker. Microwave. Washing machine. Large shared terrace. Parking (1 car). NB: There are 13 steps from the road to the property. Holidays at Apartment 1 run from Saturday to Saturday. For a better idea of where Apartment 1 is, you can see Apartment 1 on the map below. Do you want to holiday near Apartment 1 (W31115), you can see other cottages within 25 miles of Apartment 1; have a look to find your perfect holiday location.